The other two brackets have completed their games so it’s time to get the results. If you missed the other results, you can see them here. 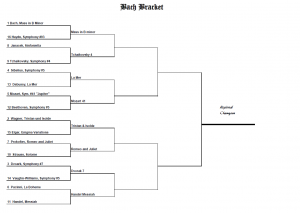 Will there be any big upsets like the Stravinsky bracket provided? 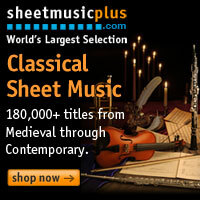 Will Mozart and Bach have the same drama as the other brackets? Let’s find out. #1 Mass in B minor over #16 Haydn Symphony no. 93 – Bach’s magnum opus is definitely better than any symphony (no matter how great) that Papa Haydn wrote. #9 Tchaikovsky 4th over #8 Janacek Sinfonietta – A mild upset here. Many (myself among them) feel the 4th is Tchaikovsky’s finest symphony. #13 Debussy, La Mer over #4 Sibelius 5th – Sibelius is probably over-seeded and Debussy under-seeded, but either way, the French guy wins. #5 Mozart 41 over #12 Beethoven 5th – It’s always hard to go against Ludwig, but the “Jupiter” symphony is Mozart’s last and greatest. #2 Tristan und Isolde over #15 Enigma Variations – Tristan is another dark horse pick to win the whole thing. Few works are as important to music as Wagner’s great opera. #7 Prokofiev Romeo & Juliet over #10 Strauss, Salome – While Salome is a great and misunderstood work, the Russian Romeo and Juliet get the win here. #3 Dvorak 7th over Vaughn-Williams 5th – Many (including Brahms) feel that Dvorak’s 7th is his best symphony. Me too. #11 Handel Messiah over #6 La Boheme – Tough draw for Mr. Puccini here. Handel was probably under-seeded, but any work this great written in 3 weeks gets my vote. #1 Don Giovanni over #16 Lucia di Lammermoor – Tough luck Mr. Donizetti, but the Don is arguably the best opera ever written. #8 Brahms 2nd over #9 Mendelssohn 3rd – The “Scottish” is a great symphony and Felix deserves better, but Brahms wrote 4 individual symphonies, each great. #4 Beethoven “Eroica” over #13 Orfeo ed Euridice – Like Tristan und Isolde, “Eroica” is too important to Western music to go out in the first round. #5 Bartok Concerto for Orch. over #12 Stravinsky Sym. in 3 Movements – Bartok’s grand concerto is one of his greatest and most accessible works. #2 Shotakovich 5th over #15 West Side Story – Ironically, I love Bernstein’s recording of the Shostakovich. #7 Barber of Seville over #10 Schumann 2 – Despite having one of the nastiest violin excerpts ever, Herr Schumann just doesn’t hold up to Rossini’s great opera. #3 Mahler 2nd over #14 Swan Lake – Another tough draw here, but Mahler’s first big symphonic “hit” gets the win here. #6 Verdi, Rigoletto over #11 Haydn, Creation – Haydn’s “B minor Mass” isn’t enough to overcome Verdi’s great opera. The most famous aria ever is probably enough. No upsets to speak of in this bracket. 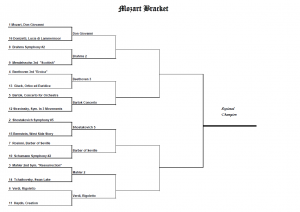 The Mozart bracket is the only one that held its seeds through the first round. Well, that’s it for the first round. 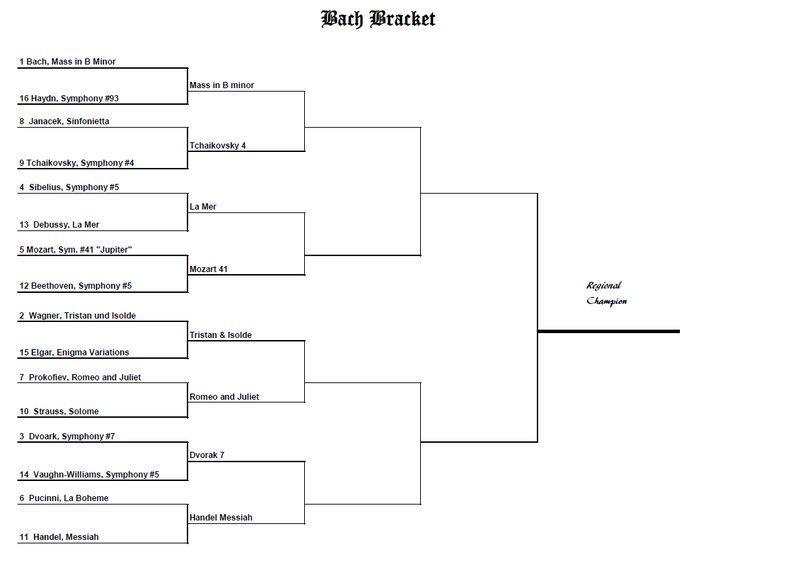 Despite some great match-ups, I think the results are pretty fair and I’m looking forward to seeing how the next round shapes up. My favorite 2nd round match is Mahler 2nd vs. Rigoletto. That’s a tough one. Anyways, I’ll be back next week with more updates. Happy music-ing!